The French artist Neïl Beloufa was born in 1985 in Paris. He studied at the École Nationale Supérieure des Beaux-Arts, Paris; the École Nationale Supérieure des Arts Décoratifs, Paris; California Institute of the Arts, Valencia; Cooper Union, New York; and Le Fresnoy–Studio National des Arts Contemporain, Tourcoing, France. His work has been shown in contemporary art venues as well as in film festivals. He has had solo exhibitions at the Kunstraum Innsbruck, Innsbruck, Austria (2012); the Kunsthaus Glarus, Glarus, Switzerland (2012); the Palais de Tokyo, Paris (2012); the New Museum, New York (2011); and White Box, New York (2008), among others, and has participated in numerous group exhibitions. His videos have been screened at the Toronto International Film Festival (2011); the International Film Festival Rotterdam, Rotterdam, the Netherlands (2009, 2012); and the London Film Festival (2009, 2010, 2011), and he was awarded grand prizes at the 54th and 57th Oberhausen Kurzfilmtage in Oberhausen, Germany. Beloufa has received many other honors, most recently the Audi Talent Award, Paris (2011). During his Hammer residency, Beloufa produced a new film exploring the iconography of the red bandana. Disparate political movements and subcultures—including gangsters, hippies, rock stars, cowboys, and anarchists—have long adopted the red bandana as a sign of affiliation or camaraderie. 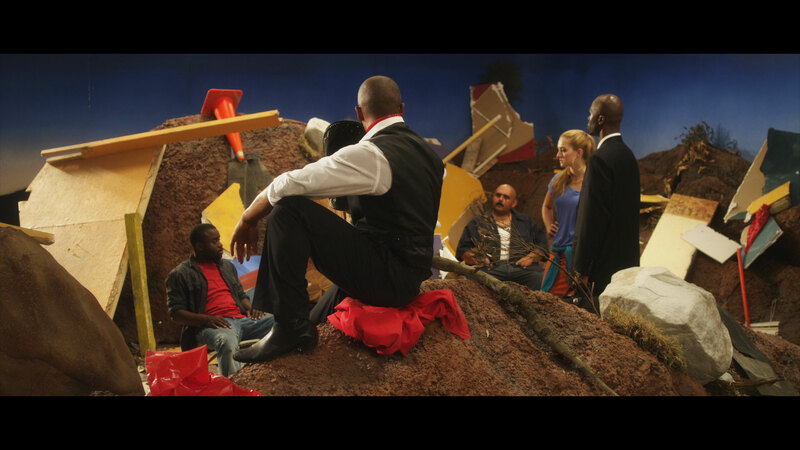 In his installation, Production Value (2013) Beloufa uses the red bandana as a vehicle in which to examine such subcultures and how these groups interact with each other and wrestle with existential issues when faced with a great catastrophe. Production Value was screened in an installation designed by the artist in the Hammer’s video gallery. The Hammer Museum’s Artist Residency Program is supported through a generous grant from the Simms/Mann Family Foundation. The residency program was initiated with funding from the Nimoy Foundation and is supported through a significant grant from The James Irvine Foundation. Neil Beloufa's new film installation, Production Value, was partially realized with funds from the Audi Talent Award 2011.